President A.P.J. 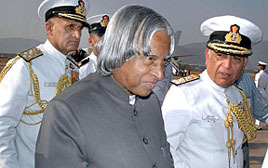 Abdul Kalam today outlined the future role of the Indian Navy with the men in blue controlling the country’s strategic interest in the eastern part of the country, including uninhabited islands in Bay of Bengal, submarines capable of firing Brahmos and other guided missiles and the fourth dimension role of the warrior in water. Shouldn't India continue to oppose a WTO settlement that adversely affects the rural sector? It’s a very important game for both the teams as whoever takes the lead at this stage will have a big advantage in the rest of the series. 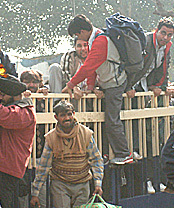 Chaotic scenes were witnessed at the Joint Checkpost here today following a rush of cricket fans for the third ODI between India and Pakistan to be played at Lahore, tomorrow. A large number of passengers were put to inconvenience after Air Sahara cancelled 10 morning flights from Delhi. The airlines was forced to cancel and delay flights across the country after 20 senior pilots proceeded on mass casual leave. A delegation of the National Democratic Alliance led by its Convener, Mr George Fernandes, will call on the President, Dr A.P.J. Abdul Kalam, on Tuesday afternoon to press for the resignation of Election Commissioner Navin Chawla. The NDA has been demanding Mr Chawla’s resignation. The President and the Prime Minister have greeted the nation on the birth anniversary of Guru Ravidas. In a message, President A.P.J. Abdul Kalam has called upon all citizens to rededicate themselves to the teachings of Guru Ravidas and come forward for the cause of the poor and the needy. Pakistan suffered a huge blow today when pace spearhead Shoaib Akhtar was ruled out of the remaining matches of the one-day cricket series against India. Akhtar, who also missed out on the first two games of the five-match series, is nursing a strained ankle and has been advised a six-week rest. The second day of the Indian Poetry Festival, which concluded at Panjab University on Sunday evening, saw feminine assertion as quite a few male writers, critics and listeners got provoked while some of the finest poems were heard in Urdu, Hindi, Punjabi, Marathi, Assami, Oriya and Dogri. Dr Tarannum Riyaz familiarised the diverse gathering with women writers in Urdu who, she said, were trying to break free from barriers raised by the family, neighbourhood and society. Q: Should lawyers resort to strikes?